If you have been stuck on the busy roads of San Rafael at night because you ran out of fuel, it can be challenging to seek help right away. With Newway Towing, no matter what time of the day you call, we can provide an immediate out of gas solutions for your vehicle. With 24/7 availability and quick response time, we can send a number of reliable technicians who can bring you a couple of gallons of fuel to help you get to the nearest service station. The techs we cooperate with will provide you with just the type of service you hope to get and all for a price that’s hard to beat. We understand that running out of gas is unexpected that is why we keep our business running around the clock. Drivers can call us whenever they need a roadside assistance, and they can seek help even at night or early in the morning. Our company is committed to helping these people get back on the road as soon as possible. Thus, we operate 24 hours a day in 7 days a week so we can assist right away. Moreover, we have several customer service representatives who will answer any calls or queries online. Whether you need immediate out of gas solutions or not, we can send our roadside assistance technicians to your location. You do not have to worry on how to refuel your car because we are just a call away. 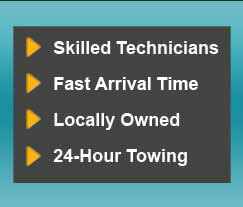 At Newway Towing, we prioritize your time and personal safety. We make sure that you get an out of gas solutions right away so you can catch up with your individual appointments and continue with your daily activities. Our team is composed of expert technicians and licensed drivers who will provide 24/7 roadside assistance in San Rafael. These individuals are highly trained experts with years of experience in dealing various vehicle issues that most drivers encounter. They are skilled, bonded, and insured to protect your valuable car all throughout the roadside assistance. They are also friendly and reliable, so you can be assured that your vehicle is in safe hands. With Newway Towing, you will never be shocked by the prices of our roadside assistance services. We understand that money is a concern among our customers that is why we keep our out of gas solutions reasonably priced. On top of that, we do not charge any hidden fees. You can guarantee that you will pay a fixed rate without added service charges which are not included in the quotation. Once you avail our roadside assistance services, we will be with you all throughout. We will explain how it is performed, the people who will do it, and the possible costs of the service. We always aim to create a long list of happy and satisfied clients. Hence, you can never go wrong if you seek us for help. When you need emergency roadside assistance services, call us right away at Newway Towing. It is our passion to help the drivers in San Rafael seek the best services at an affordable price.